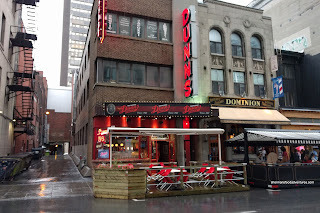 As much as we have a Dunn's Famous in Vancouver, we decided to visit the original one in Montreal for a couple of reasons. First, it would be a good comparison between the 2 and second, we really needed something relatively fast and casual. Yes, it wasn't lost upon me that it was a really touristy thing to do since THE place would've been Swartz's (that's coming up) and also Snowdon Deli. Remember, many of the places we have visited on this extended trip had been circumstantial due to the 4 kiddies in tow. We were able to snag some seats quickly and got down to the ordering. 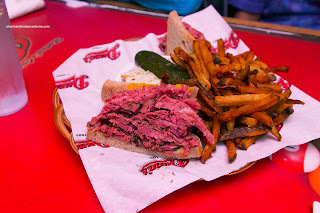 Of course I had to get the Super Combo Smoked Meat in medium with fries, coleslaw and pickle. This was pretty good with hand-sliced buttery meat that almost melted-in-my-mouth, yet still had a certain meatiness. It was flavourful and rich without being overly salty. I thought the fries were pretty good but could've been crispier. Viv ended up with Dunn's Famous Poutine which was similar to the one in Vancouver except for the fries. I actually prefer the ones from Vancouver more as they are crispier. The gravy was nicely thick and flavourful while the cheese curds were mostly melted. 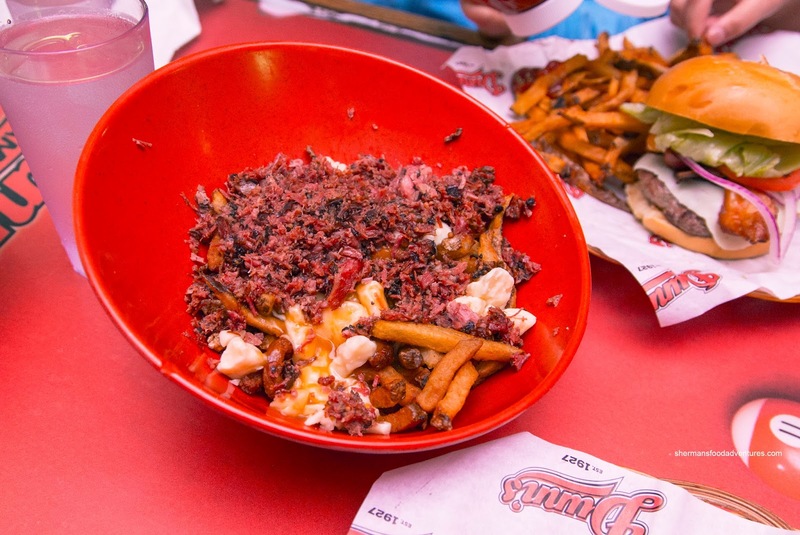 Loved the amount of smoked meat on top. Made the entire thing rather hearty. My son went for his standby being the Bacon Cheeseburger that sported a really large patty. We asked for it to be prepared medium-rare, but it came out to more like medium-well. Despite this, it was full-flavoured and moist with an appealing meaty texture. 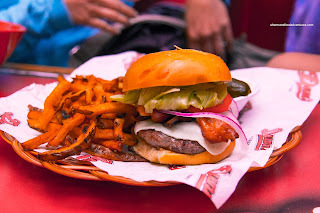 The bun, on the other hand, was a fail for us as it was cold, dense and overly chewy. My daughter went for the Kid's Spaghetti and it was more or less a obligatory children's menu offering. 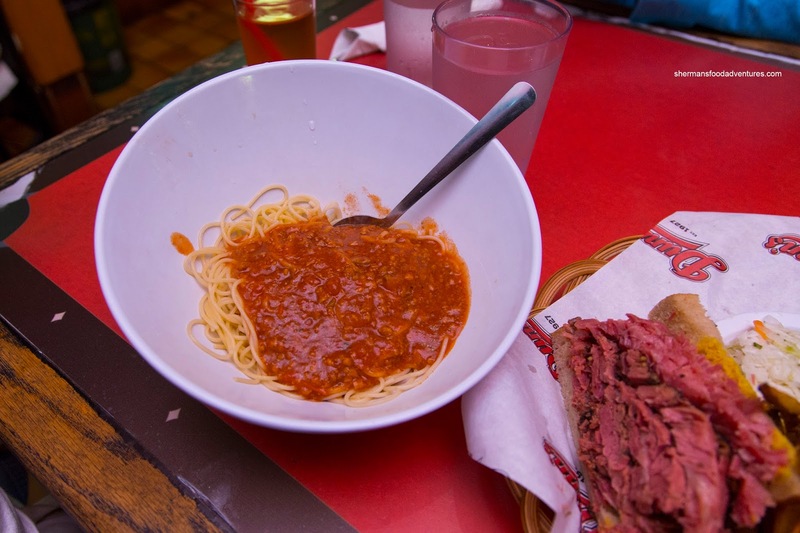 The pasta was a bit soft while the sauce wasn't overly flavourful. It had a spicy finish tough. 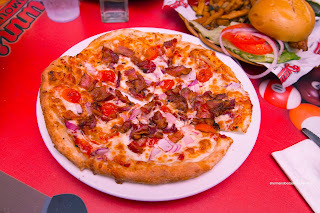 Costanza ordered a Quebecois Pizza with bacon, cherry tomatoes and red onion. Surprisingly, it was actually decent with all things considered. The crust was relatively thin while the toppings were plentiful. The middle was pretty soft though while the edges were crispy. In the end, Dunn's served its purpose where we were filled with food when we needed it most. The smoked meat was pretty decent wile the pizza was surprise. However, everything else was rather mediocre.